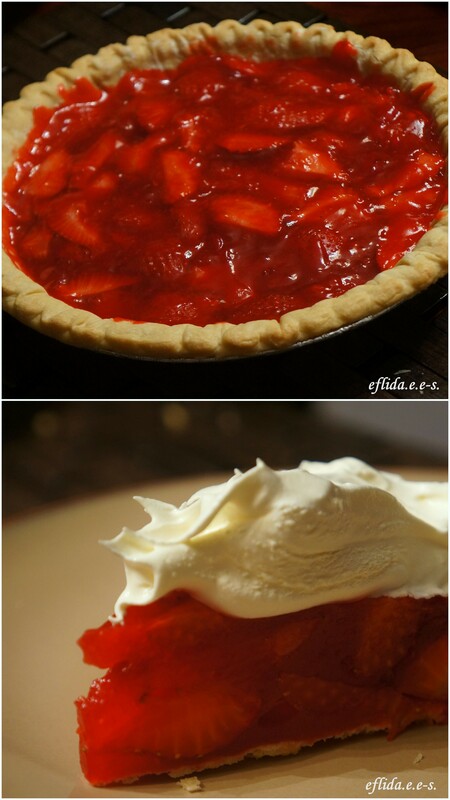 strawberry pie recipe – i am uniquely and wonderfully made. Mix flour, oil and salt until particles are size of small peas.Sprinkle in water, 1 tbsp at a time,mixing until all flour is moistened and pastry almost cleans side of the bowl. (if pastry seems dry, 1 to 2 tbsp oil can be added.Do not add water.) Gather pastry into a ball. Shape pastry into flattened round. Place flattened round between two 15-inch lengths of waxed paper . Wipe table with damp cloth to prevent paper from slipping. Roll pastry 2 inches larger than inverted pie plate. Peel off top paper. Place pastry paper side up in plate. Peel off paper. Ease pastry loosely into plate. Trim overhanging edge of pastry. Wash and stem and cut strawberries. Set aside. In a saucepan, combine sugar, cornstarch and water. Cook over medium heat stirring constantly for 8-10 minutes until mixture turns clear, thick and bubbly. Remove from heat and stir in gelatin, lemon juice and vanilla. Cool for 5 minutes. Fold in berries and pour into baked pie shell. Chill for 4 hours or overnight. Add a dollop of whipped topping to each pie when serving. thank you amy. ill make one for you soon. i miss you.